Healing the Invisible Wounds: Children’s Exposure to Violence is a resource to help parents and other caregivers understand the potential impact of exposure to violence on the development of their children. It provides practical suggestions for supporting the healing process. Recommended strategies are tailored to children based on age (birth to 6, 7 to 11, and 12 to 18) and are easily integrated into every day interactions. Little Eyes, Little Ears is a resource for anyone looking to understand how children experience violence against their mothers and how those experiences may shape them as they grow, from infancy to adolescence. 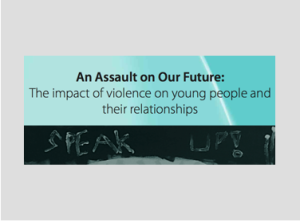 Assault on Our Future is a report on violence in young people’s lives was released recently in Australia. It’s a synthesis of national and international research on children’s and young people’s exposure to violence in their families and in their own relationships, its impact, and its prevention. Assessment for Lifetime Exposure to Violence addresses the compelling evidence that lifetime exposure to violence is exceedingly common and has serious long-term implications. There are parallel patterns of adverse health outcomes associated with childhood and adult exposure to violence ranging from chronic diseases to health compromising behaviors to future violence. Assessing for lifetime exposure to violence can lead to more effective care for existing health issues, detection of hidden risk behaviors that are highly correlated with past exposure to violence, and prevention of future disease and violence. Linda Chamberlain and Peggy Brown (2006). Addressing Domestic Violence, Child Safety and Well-Being: Collaborative Strategies for California Families provides recommendations from the California Leadership Group on Domestic Violence and Child Well-Being. Principal authors: Rosewater, A., and Moore, K.